Although I have already done an extensive number of in-depth posts on my transition to Roll Line plates, I thought I should do a more general post for my skating equipment series. The skating plate is definitely the portion of the skate where you want to make a good investment, as most plates stay with a skater for years, and are often only replaced when the skater’s foot changes size. My recommendation is to buy the best plate you can afford, as it will be the part of the skate that lasts the longest and a skate made with higher quality materials is much more durable in the long run. That being said, often times the best plate is not the most expensive plate. 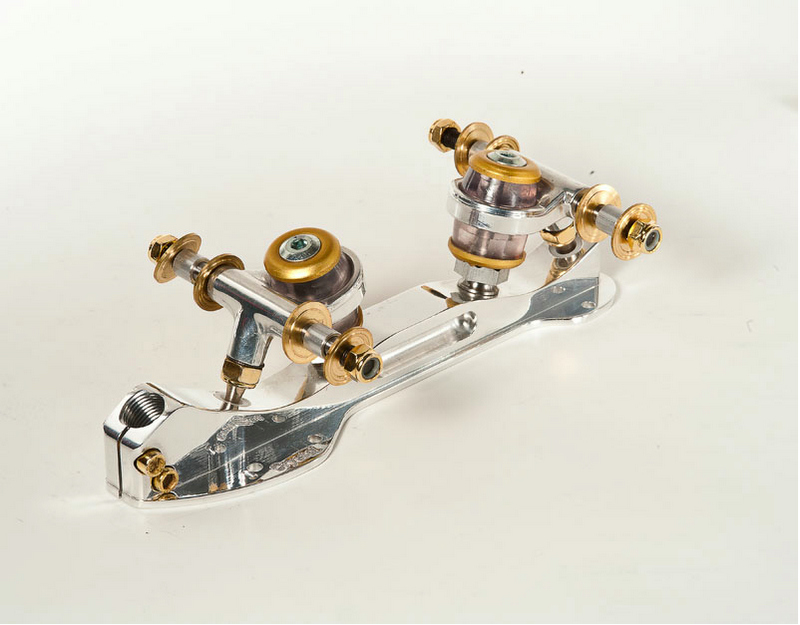 As with wheels, there are many different styles of skate plates that are best suited to different types of skating, so you should first have an idea of what you want to accomplish, then decide which style of skate is best suited to your needs. As with my previous posts, the discussion here is limited to artistic skating – Derby, hockey, and speed have different needs and will have different opinions about the best type of skates. 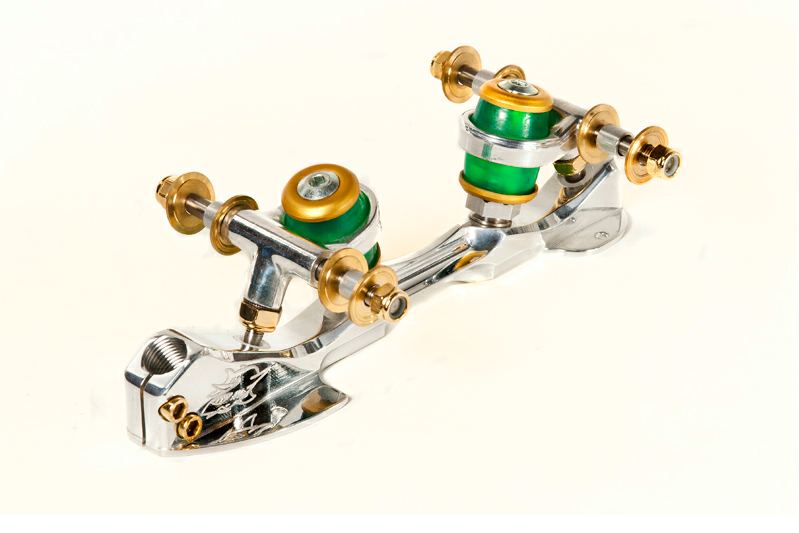 Roll Line has come to dominate the skate market, especially in the area of skate plates. With styles suited to the beginner all the way through world class competitors, there is probably a Roll Line plate to meet your needs. Figures: Roll Line offers several styles of figure skates. The main ones are the Giotto and the Ring, although they also offer Raffaello skates for newer figure skaters. I have tried both the Giotto and the Ring, and distinctly preferred the Giotto because I felt like it had a more consistent curve while still having great response and quick turns. The Ring plate was a good figure plate, but I felt that it was not quite as stable as the Giotto, and while it was touted as a great loop skate I found that it was very difficult to create the right amount of pressure to have enough control of the skate around the crown of the loop. I have not tried the Raffaello skates (they are sized for younger skaters), but the skate is set up to have a similar action to the Giotto, so I assume it will have similarly stable feel. I would like to point out that the Giotto plates have a size exchange program, whereas the Rings and Raffaellos do not, so for growing figure skaters, it might be best to invest in a Giotto right away, rather than buying new plates every time your child grows. Dance: Roll Line probably has the widest range of options for Dance skates. Because skaters who only do compulsory dances don’t need toe stops, they can use plates that don’t have spaces for toe stops, or plates that have removable toe stops. Skaters who want to use the same skates for dance and freestyle will need a plate with a removable toe stop, although some skaters do skate dance with toe stops in their skates (I tend to trip over toe stops when I have tight footwork, but some skaters don’t like to skate without them). World class dance skaters need to do compulsory dances (without toe stops) and free dances (with toe stops), so most of these skaters choose plates with removable toe stops, although some simply use two pairs of skates. 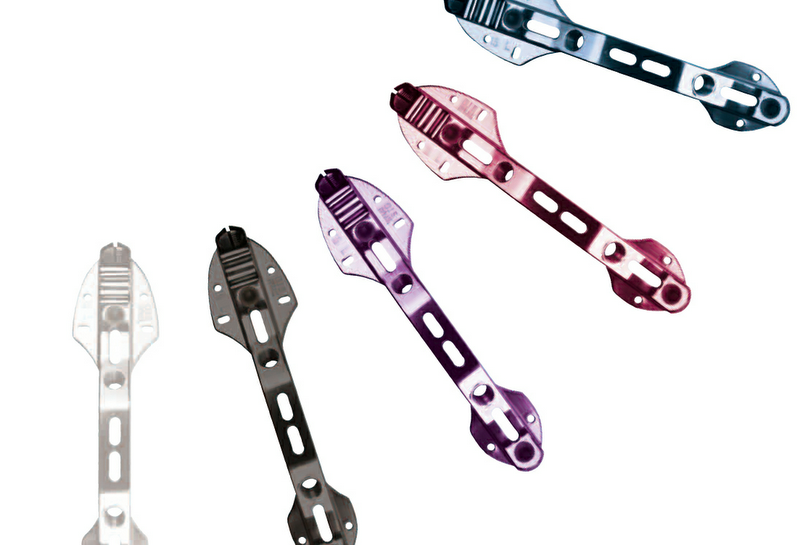 Options for toe-stop-less plates include: Ring, Giotto, and Raffaello, and options for the dance plates with removable toe stops are: Dance, Energy Steel, Mistral, Mariner Cup, and Variant plates. 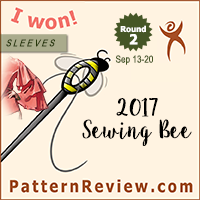 I have been skating on the Dance plates this past year and love them – they have a slightly lower center of gravity and I find I can get much deeper edges with more stability than I could on my old Atlas plates. However, the Dance plates only seem to come in limited sizes, so if you don’t fall in that range or need a half size then the next best option is probably the Energy Steel. I imagine that this would feel like skating on the Giotto, which is an excellent plate. 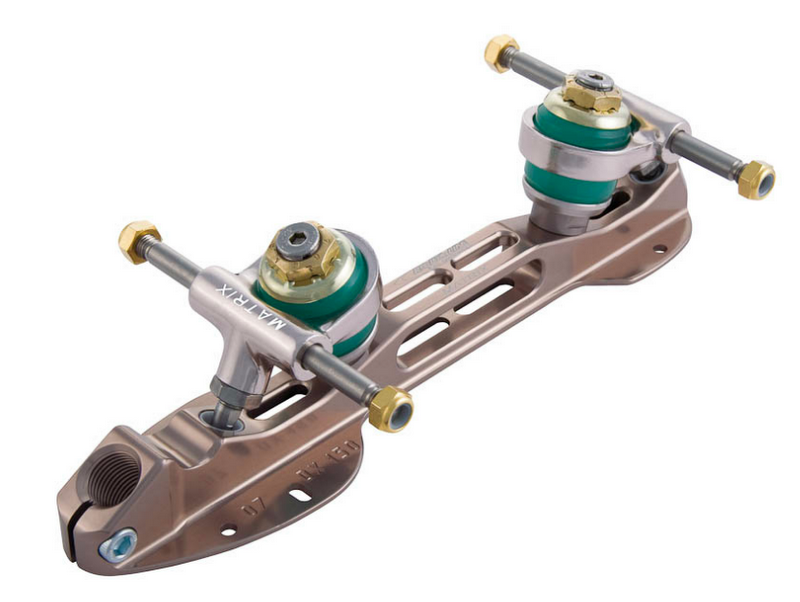 Since dance skaters aren’t placing the force on the axels that a freestyle skater would, there isn’t really a need to pay more for titanium axels, and the Steel version should work just fine. Only the Variant and Energy plates have size-exchange programs, which is why I would recommend those to families with growing skaters. Freestyle: Freestyle skaters have, by and large, almost completely gone to using the Roll Line plates, especially those skaters at the highest competitive levels. Freestyle skaters (obviously) require a place for a toe stop, and they put far more stress on their skate than a dance or figure skater, so the options for the freestyle plate are somewhat narrowed by this. For freestyle I would recommend: the Matrix or Energy Titanium for older high level skaters, Energy Steel for mid-level skaters, or the Variant for beginning level skaters. While you could use the Mistral or Mariner Cup, they are made from a slightly less strong alloy than the Energy or Matrix plates, so for fully-grown skaters doing double and triple jumps, it is probably advisable to invest in the more expensive plates. Again, only the Energy and Variant have size-exchange available, so that might be something to consider when deciding which plates to buy for growing skaters. Pros: These are most popular plates in the US (and possibly the world) right now, and they provide excellent stability with fast reaction times and have enough models and styles to suit a skater’s specific needs. They also have 5 hardnesses of urethane cushions and 3 hardnesses of rubber cushions, so it is easy to tailor a skate’s feel to the individual who is skating on it. 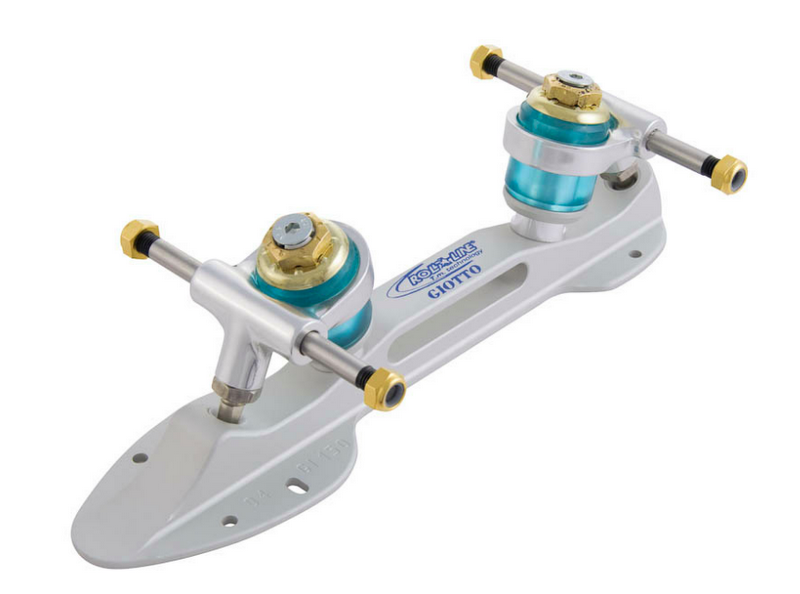 Since these skates are still in production, it is possible to get replacement parts and fix them should something happen (I have seen titanium axels break when a skater landed a triple jump… not often but it does happen on occasion). Also, other than the Matrix plates (and some parts on the Dance and Ring plates), most Roll Line parts are interchangeable, so that makes it easy to swap cushions and other parts between plates should the need arise. Cons: Only some models have size-exchange programs, and not all models come in half-sizes. Roll Line plates tend to be expensive (most of the plates used by serious competitors range from $350-$1000, but even the lower end models are at least $200), and they are new enough that there aren’t a lot of used ones lying around (perhaps this is a plus, as it speaks to their durability?). Compared with Atlas plates, changing cushions is a pain, as is making constant adjustment to the action (such as switching between figures and loops). 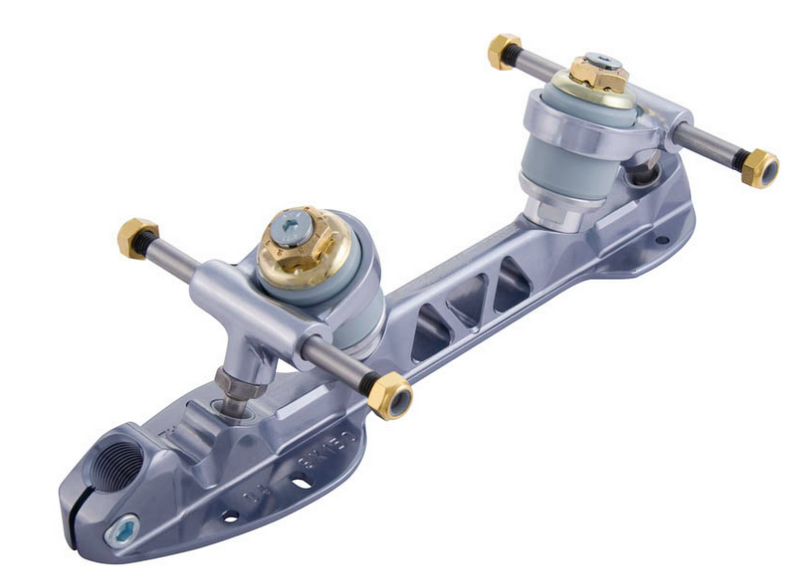 Also, the SkatesUS is pretty much the only distributor, so if you are looking for a specific part you have to call and talk with them, and most parts are not easily orderable from the interent. Before Roll Line took control of the market, Atlas was the top figure plate in the US. Many skaters are still using Atlas plates today, especially for dance and figures, though much less in freestyle, at least at the top levels. It is a bit more confusing to keep track of all the Atlas plate models and designs, but most of them are identified with a year, and some of them are specified as having a steering damper, while others are not. 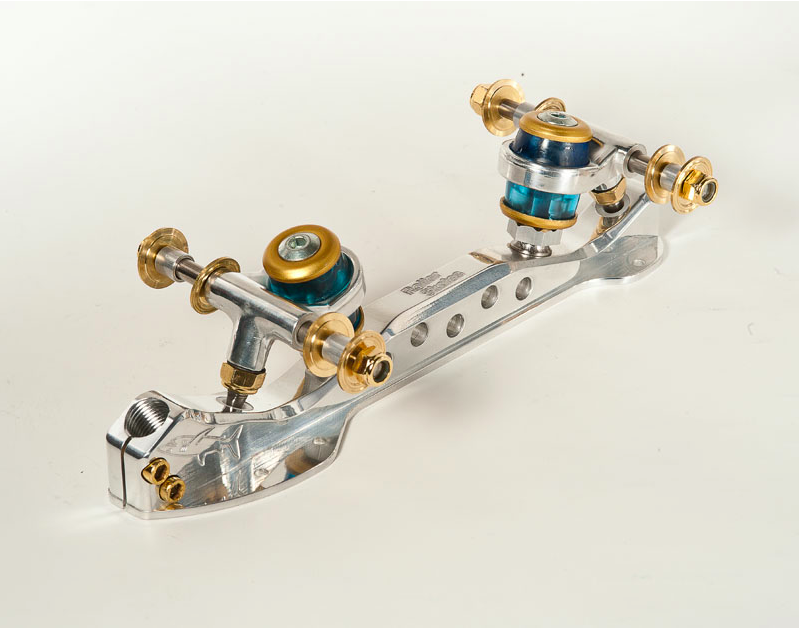 In general, the models without a toe stop were designed for figures and dance, while the models with a toe stop were designed for freestyle and dance. Pros: These are still excellent plates, especially for figures and dance. I prefer the Atlas plates for loops to any of the styles of Roll Line plates. In general they are about the same or slightly less expensive than the Roll Line plates. Skates US also offers a size exchange program (it seems to be valid for all models), and so these can be very cost effective skates for the grown skater. Because they were used by so many skaters who have now switched to Roll Line, you can often find used plates for much cheaper than new ones. Also, it is very easy to change cushions and adjust the action on these skates. Cons: These plates do not seem to have held up as well for freestyle skaters as the Roll Line plates do. Because they have been going out of favor, it is increasingly difficult to find parts. The manufacturers have been trying to push urethane cushions to compete with the Roll Line plates, but for Atlas the rubber cushions are far superior. Also, unlike the Roll Line plates, many of the various version of Atlas plates do not have interchangeable parts, so you have to be very careful and very specific when you are looking for replacement pieces. 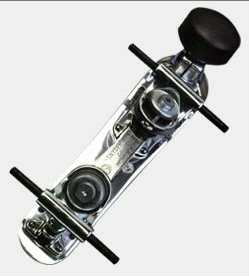 Snyder skates used to be the ultimate in skate plates, but were replaced in popularity by the easily adjustable Atlas, and now Roll Line plates. Most skaters who use Snyder today have kept them from the late 80s/early 90s. Current models of Snyder plates seem to be popular with the Derby, jam, and session skating crowd, but are not as popular with the artistic group. Several models are available, including the Deluxe, the Imperial, and the Advantage, with figure, dance, and freestyle versions available. I have never used a Snyder plate myself, but my sister used one during her last year of skating. Pros: These skates were very popular, and it is usually easy to find some used plates or old spare parts. Many skaters still love the Snyder plates, and you will occasionally see them being used by an older dance skater. These plates are generally less expensive than the Roll Line plates, at least when compared to the high end models. Cons: In general these skates are heavier than the Atlas or Roll Line plates, and so were not as favored for freestyle skaters doing jumps. They also seemed to be more difficult to adjust and I have been told that (in the 80s and 90s at least) they didn’t hold up as well to the rigors of freestyle as the newer plates did, so many skaters made the switch to Atlas or Roll Line at that point. STD (Skating Technical Development) aside from having an unfortunate acronym also seems to have an unfortunate reputation. These skates are “made in Spain” although I have heard from other sources that the skates are actually made in China and distributed from Spain. Many people consider them to be poorly executed knock-offs of Roll Line Equipment, and the (few) people who have been able to acquire them in the US have not spoken well of their quality. 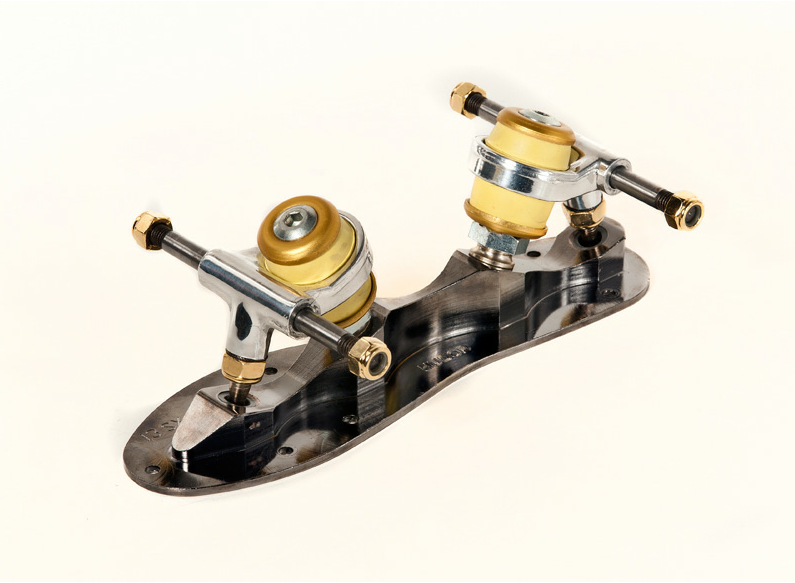 There has been speculation over the durability of the carbon fiber plates, and most people who consider these skates go with the Roll Line instead. Pros: They come in pretty colors, lots of styles, many sizes. 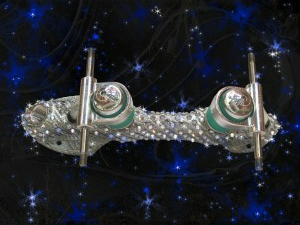 You want a bejeweled skate? They got it. Also, since they seem to be a Roll Line knock off, some adventurous souls have reported using a Roll Line truck on a STD plate to have the ultimate mix of style and control. Cons: These plates are impossible to find in the US, and I haven’t heard of many people using them in other parts of the world either. Apparently there are a few dance skaters who like their wheels, but, in general I haven’t heard any favorable comments about their equipment. With prices comprable to Roll Line (and shipping and import costs making them prohibitively expensive), honestly, I can’t see why you wouldn’t just go with the real deal. Apparently there are some new plates out of Italy? I am not sure who exactly is the manufacturer, but according to this website, they are being favored by several world champions over the Roll Line plates. It looks like they are focused mainly on freestyle skaters with their Piranha, Shark and Cristal models, as well as figure skaters with the Hudor (is the name an homage to the old Hudora skate that many people loved by is no longer available and was difficult to acquire even back in the 80s? ), with the Paioli models geared towards the younger skaters. As is often the case, the rest of the world will hear/test/see new skating equipment long before it becomes available in the US (Komplex wheels perhaps excluded), so it remains to be seen if/when these plates will become popular in the US and if they will overtake the Roll Line market share (somehow I am doubting it, as I can’t imagine anyone in the US acting as distributor for various reasons), but I will be very curious to see how the news of these plates spreads and if they start popping up on various competitors (if they do, my bet is we won’t start seeing them until January – after worlds). The Piranha – A top of the line freestyle skate. The Cristal – looks most similar to the Roll Line design. 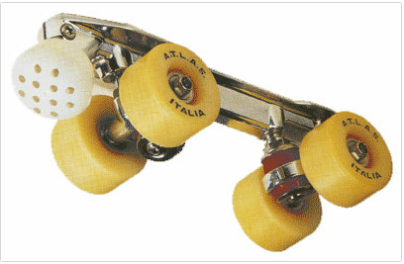 These skates look like they combine the best of the Atlas (top down action adjustment, rubber cushions for figures) with the best of the Roll Line (interchangeable parts, plate shape to minimize weight and maximize strength, urethane cushions for free skating). I find the double toe-stop screw to be fascinating (logical, perhaps, for those attempting triples) and ponder how the action would feel in comparison to the Atlas and Roll Line plates I have been skating on up to this point. As they are new I don’t really have a feel for how they would hold up under the rigors of training. I suppose if I ever get really curious or find myself in a situation where I am desperately needing plates and unhappy with my options, I can always order some from the UK. There are many other plate brands that do or used to exist. I know that the Labeda dance plates were favored by many world class dance skaters long ago (some people still use them today), and the old Hudora plates were much beloved by loop skaters, but as with much skating equipment, they were either too specialized or hard to find and not generally adopted and have fallen out of use today. Kompelx has hinted that they are developing their own brand of plates, so it should be interesting t see how their model compares with the Atlast/Roll Line/new Italian plates. There are many other brands of plates that are still in use today (PowerDyne, etc.) but these plates are not generally used by artistic skaters, and so have been left out of this discussion. Well, I use both Roll Line and Atlas plates, because I feel that they have their own special niche for the types of skating that I do. I haven’t really used any other types of plates (well, I used a Sure Grip skate package when I first started) so I suppose I am a bit biased on my comparisons, but right now Roll Line has such a dominance in the market that I don’t even know if it is possible to make other comparisons. I will be excited to see if these new Italian plates shake things up a bit, but I expect that Roll Line will continue to dominate the US market for the next few years at least, if not much longer. So, what about you skating readers? Which plates do you use? 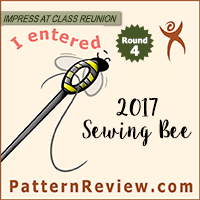 Which have you tried, and what did you like or not like about them? Have you heard anything (good or bad) about STD plates or these new Italian plates? Do you find yourself wanting to try them, or are you incredibly loyal to the skates you are on now? Please discuss in the comments! I skate on rolline and find them amazing 🙂 Yet again, I would say the US has a lot more variety in what you can get via plates though. Yet again, Nz's main plate would be rolline perhaps with atlas plates around too, as I know my figure skates have atlas plates. As far as I am aware it's confirmed the Komplex is bringing out plates for skates (see their Italian page on facebook? I know it's on skatewell's page on there at least). I don't think I would change plate anytime soon, maybe because I've only really had my dance skates (with a free plate) for maybe just over 6 months… and my atlas plates? well they're just too good to give up. I always think it is interesting what skaters from other countries are using or have access to use. It does seem that Roll Line is the most widely used plate in the world (I know people who skate in the US from Canada and Brazil were using Roll Lines), but it also seems that skaters from Europe (and sometimes South America) tend to have access to and use newer equipment before the rest of us even know it exists (of course, most of the world champions are from Europe and South America now, so that correlation makes sense). 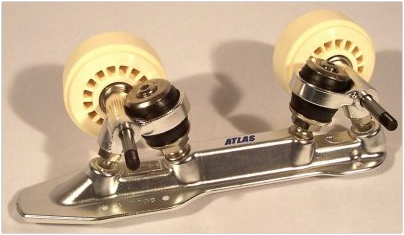 I agree about the plates though – I just got some Roll Lines last year and I love them for figures and dance, but I still prefer the Atlas for loop skating. These new plates look interesting, but it is a bit soon for me to consider switching and I am wondering how long before the rest of the world gets access to them?